Whenever I’ve made something amazing I feel as though I should share with you. Unfortunately I don’t always get around to doing so but today is the exception. 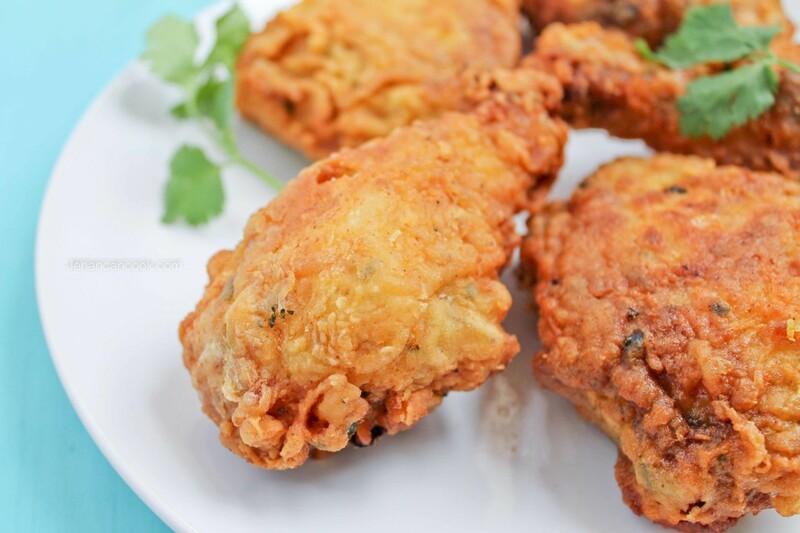 You need to try this fried chicken; it will change your life! Well maybe not your life but it will excite your taste buds. I’m a lover of curry so it should come as no surprise that I have yet another recipe using curry powder. I will say that this is not an in your face curry flavor but it you will know that it’s there. 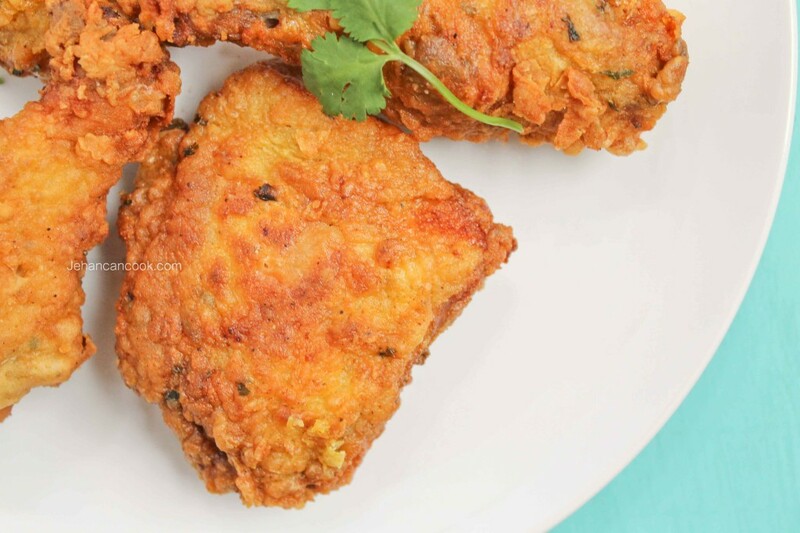 It’s a nice twist on Southern Fried Chicken that is so widely loved. I mean who doesn’t love fried chicken? Anyone, anyone? I didn’t think so. While this recipe is a bit longer than usual, taking the extra step to brine the chicken is totally worth it. Brining produces the juiciest, most flavorful chicken ever. Let me just say that we devoured this like ravenous dogs so get frying! Mix all ingredients for the spice mix in a small bowl and set aside. Place 4 cups of water in a large stock pot with sugar, salt, garlic, thyme and red pepper flakes then bring to a boil. Once water is boiling remove brine from heat and allow to cool completely. Add 3 cups water, coconut milk and chicken. Allow to sit for at least 4 hours, preferably overnight. Next, drain all liquid and pat dry. Add 1 tbsp of spice mix to chicken and rub making sure to coat well. Place 1 cup flour in a large plate and add 1 tbsp of spice mix, mix to combine. In another large plate add the remaining 1 cup of flour. In a large bowl whisk together eggs and milk. Coat chicken in seasoned flour, making sure to shake off any excess then quickly dip in egg mixture. Allow the excess egg mixture to drip off chicken before adding to the plate of plain flour. Once again shake off excess flour and then set aside. Repeat with each piece of chicken. Place a heavy bottom pot over high heat with 2 inches deep canola oil. Once oil is hot, lower the heat to medium low. Now carefully add chicken pieces into oil and fry 10 minutes, then flip. Fry for an additional 10 minutes or until golden brown. Remove from heat and place on a plate lined with paper towel to drain excess oil. If the chicken browns too fast that means the oil and too hot and it won’t cook through on the inside. However if the oil is not hot enough the chicken will soak up the fat and become greasy. Shaking off the excess flour is an important step. By shaking off the excess flour it ensure a thin crispy crust. What you don’t want is a thick bready crust. Brining meat will definitely give it a little something extra. 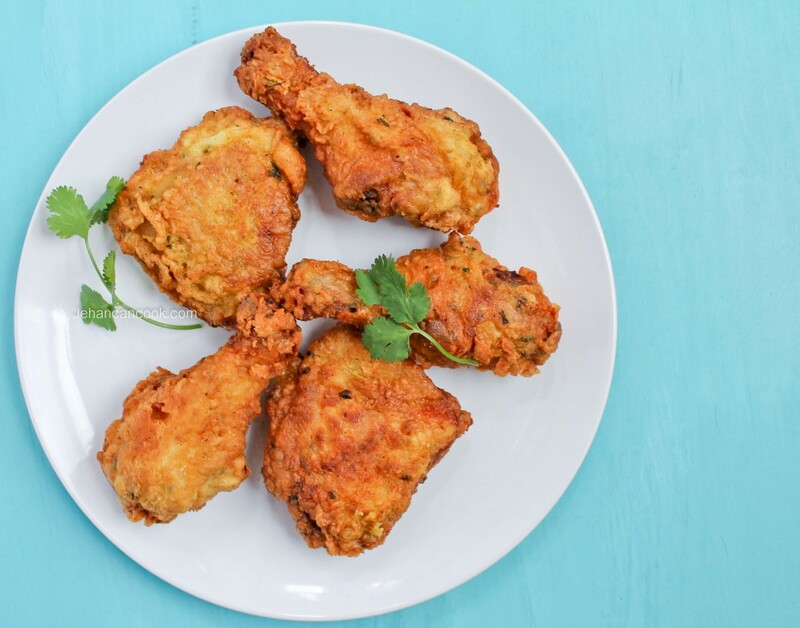 That’s a great start to tender, juicy fried chicken. Yum Yum, always love your recipes! Kiss the baby!